The Micro Bop was designed for big performance in the smallest possible package. Sacrifice nothing and gain the ability to house a world class electro percussion system in your dorm room or apartment. We never liked the “one size fits all ” mentality. The Micro Bop’s compact size makes it the winning solution when space is an issue. Packed with all the same features and functions of our Classic and Bop Dlx sets, the Micro Bop offers one other thing the competition can't touch: Choice! 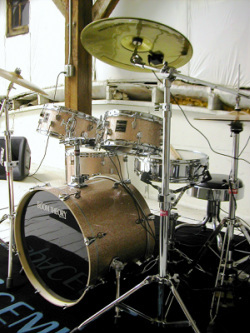 “ Many performance elements contribute to electronic drums' authenticity. The Bop Dlx (like all our drums) emphasizes motor memory. The move between Spacemuffins and your acoustic kit is seamless! You didn’t hone your skills on little rubber pads or a tennis racket, you did it on drums. We offer nothing less. Menacing in appearance, low and stocky, the Bop Dlx is a focal point on any stage. really real. Probably because they are real. If the Classic Series were a Hot Rod, it would be a sleeper. This wolf in sheep’s clothing leaves nothing to be desired for performance onstage or in the studio. 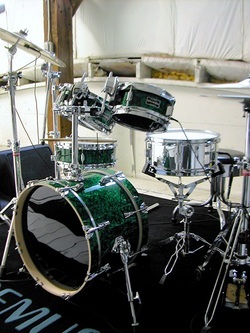 The Classic’s “traditional look” has made it a popular choice with gigging pros and with our Church customers seeking a solution for their Music Ministry's percussion problems. “How do the drums track? Outstanding! It took just minutes – really! – Only about ten minutes to plug the drums in and adjust the gain, threshold and cross-talk controls to optimum levels. If you're looking for an electronic drum that will track a closed roll, offer a full range of playable dynamics, track well over 100 percent of the head’s surface and not have any hot spots, this is the drum! 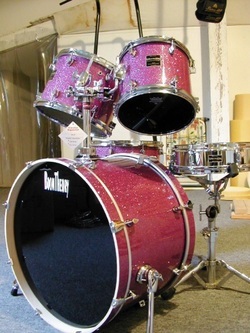 Without a doubt, the Spacemuffins drums feel and track as good or better than anything that’s ever been available”.